Are you vegan or allergic to dairy? 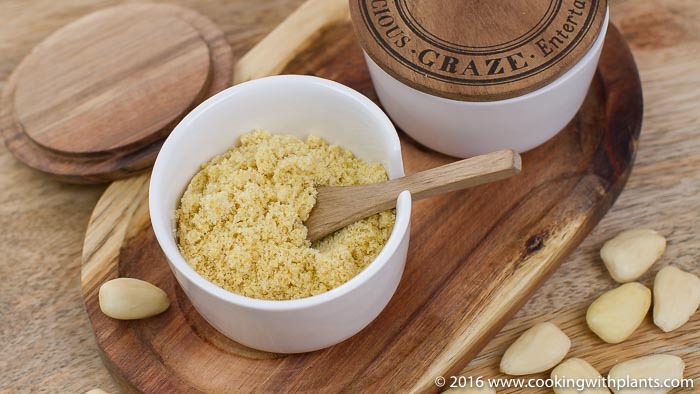 Then this vegan parmesan cheese recipe is perfect for you! It is so tasty over pasta, on potatoes, on lasagna or on a salad. In fact it tastes so darn good that I have it with just about anything. Enjoy! Place all the ingredients in a blender and pulse about 10 - 20 times until the mixture resembles fine breadcrumbs. Be careful not to over-blend or you may end up with nut butter. I use 5ml tsps, 20 ml tbsp and 250ml cups. Great alternative to the real parmesan, which is full of bad fats for your body.. Love, love, love this simply recipe. Just made it, and it’s yummy. Thanks, Anja! So good! Actually, still had tiny pieces of almond and it was great! Thank you. Just made this. It is amazing!! Thanks for another great recipe. Love your channel. How long does the various foods keep? The cheese in particular. I just made this using walnuts instead of almonds… It is absolutely delicious! I totally don’t miss parmesan with this recipe!